When it comes to pasta machines, Mamma Giuliana has only one brand in her heart: Marcato. Her grandmother gave her a Marcato pasta machine when she got married in the 1970s and she has been using that exact machine ever since! When we had to buy pasta machines for our Local Aromas kitchen, there was no arguing at all. Marcato. Period. 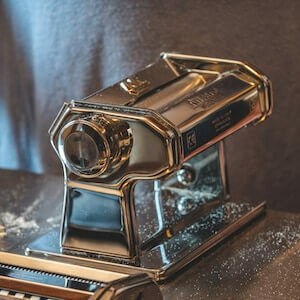 The Marcato pasta machine can be manual or electric. It also comes in different sizes according to how wide you want your pasta sheets to be. At our Local Aromas kitchen, we use the manual, 180-millimeters wide version. If you have questions and would like more information about the products we love and suggest, please reach out! We use them all the time so we definitely have useful tips to share. When it comes to pasta machines, Mamma Giuliana only has one brand in her heart: Marcato. At our Local Aromas kitchen, we use the manual, 180-millimeters wide Marcato pasta machine.